Animators worked with a facial action coding expert to ensure expressions were empirically valid for wide-ranging emotions. Last summer, a breakthrough discovery proved that the brains of some children can be trained to boost their empathetic behavior by playing a specially designed video game. For the first time, hard medical evidence – comparisons of “before” and “after” brain scans – revealed increased connectivity in key neural networks related to empathy and emotion control in middle school students who played the game for as few as six hours. But this discovery would not have been possible without an effective change agent. Researchers at UW-Madison’s Center for Healthy Minds, led by renowned neuroscientist and author Richard J. Davidson, selected an unlikely change agent – an artful sci-fi video game designed to teach empathy. The researchers developed the innovative video game, Crystals of Kaydor, around the challenges of a stranded space-exploring robot who must build emotional rapport with local inhabitants to survive. Mike Beall, an educational game designer and director of Gear Learning at the Wisconsin Center for Education Research in the university’s School of Education, says he began bringing this game to life only after months of working with the researchers. “This was the most compelling and challenging game design I’ve ever faced,” says Beall. “There could be no written or verbal communication of any kind from the main characters. 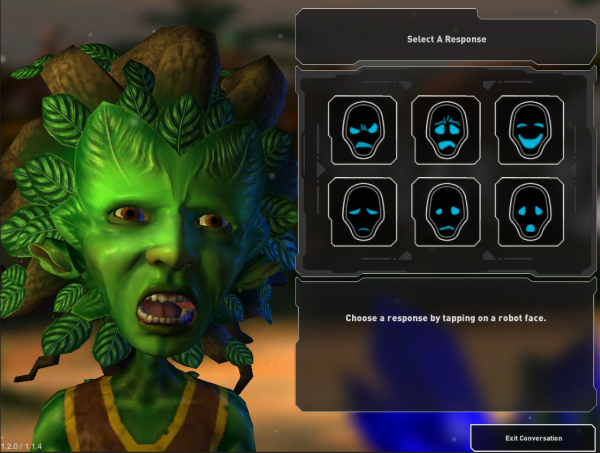 Everything had to be about understanding emotion.” Beall and his team of experienced artists and programmers at Gear Learning worked for a year to create humanlike faces showing emotions such as happiness, surprise, fear, sadness and anger, along with an entertaining and instructive game plot.